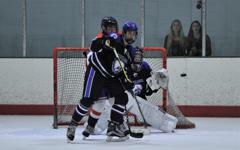 Farrell Dinn scores one of his three goals in the Eagles 5-1 victory in the MAPHL AA Division championship game. 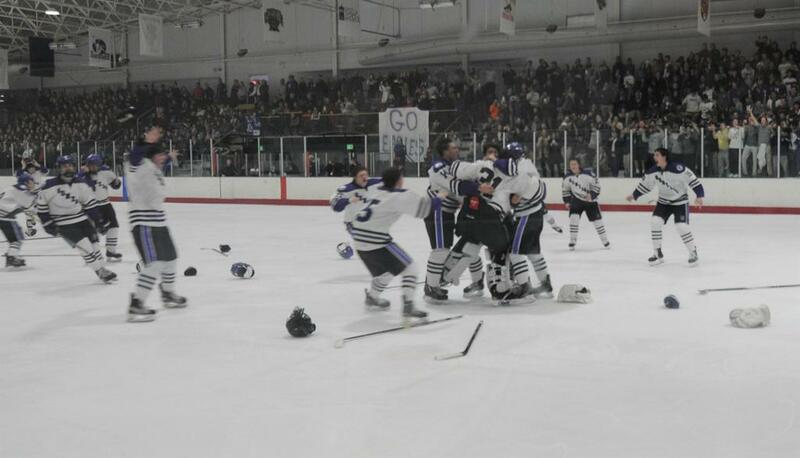 The Eagles defeated Spalding, 5-1, to win its third consecutive MAPHL AA Division title and sixth in the last 10 years. Farrell Dinn tallied a championship game hat trick and goaltender Peter Pirone stopped 17 of 18 shots in the win. 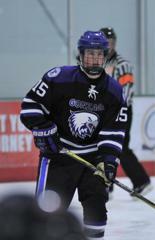 Sean Kilcullen and captain Tommy Kristinicz also scored for the Eagles. Gonzaga's improbable playoff run started with a 4-1 win as the fifth seed over #4 O'Connell in the quarterfinal round and a 5-2 semifinal win over Landon. Gonzaga's Varsity II squad was stopped in its attempt for a fourth consecutive title after falling to St. Mary's Ryken, 4-2, in the championship game of the A Division. 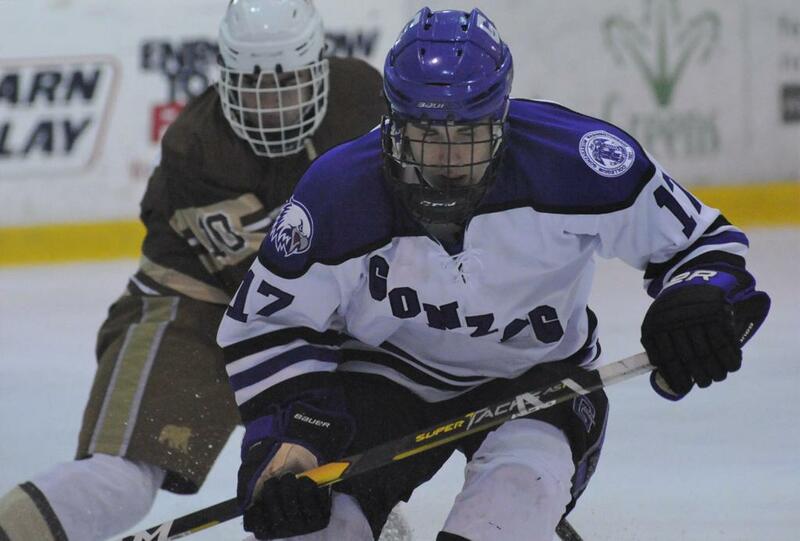 Jack Massey scored both goals in Gonzaga's 2-1 semifinal win against Landon at the Fort on Thursday. The Eagles will face off against Spalding in the MAPHL AA Division championship at 7 p.m. at The Gardens Ice House in Laurel. The Gonzaga Eagles will attempt to win their third consecutive MAPHL championship after edging Landon, 2-1, in a semifinal game at the Fort on Thursday. The Eagles will face Archbishop Spalding on Friday at 7 p.m. at The Gardens Ice House in Laurel after the Cavaliers shut out St. Albans, 2-0, in their semifinal game. Jack Massey scored both goals in Gonzaga's win. The Eagles will be gunning for its sixth AA Division championship in the last ten years, while the Varsity II will be going for its fourth consecutive A Divsion title on Friday at 5 p.m. at Laurel. 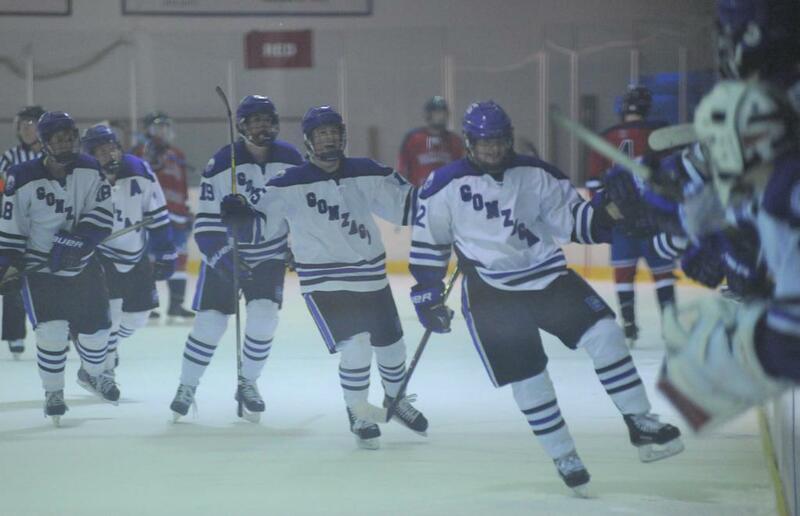 As the fifth seed, Gonzaga's playoff run started with a 4-1 upset of fourth-seeded Bishop O'Connell on Tuesday at the Medstar Capitals Iceplex in Arlington. Then things got interesting. In succession, #2 St. John's fell to #7 St. Albans, 4-3, #3 Georgetown Prep fell to #6 Spalding, also by a 4-3 score, and then #8 Landon knocked off #1 DeMatha, 5-3, in Laurel. Because the MAPHL reseeds after each round, the Eagles find themselves as the top seed in the semifinal round. They will now face Landon in the semifinals, while Spalding will play St. Albans. Because of the snow storm, the MAPHL semifinals have been rescheduled from Wednesday to Thursday, February 21. Gonzaga will face Landon at 4:30 p.m. at Ft. Dupont in the top-flight AA Division, while the Eagles' Varsity II team will play Good Counsel in the A Division semifinal in Rockville at 3:45 p.m.
Luca Docking and the Eagles will face off against Landon in the MAPHL semifinals after both teams vanquished higher seeded opponents in the quarterfinal round. Gonzaga fell to the DeMatha Stags, 7-3, in the semifinal round of the WCAC playoffs on Wednesday at The Gardens Ice House in Laurel, Md. Next up is the MAPHL playoffs where the #5 seed Eagles will face off against #4 Bishop O'Connell at Medstar Capitals Iceplex in Arlington on Tuesday, February 19, at 3:20 p.m. The Gonzaga Varsity will be attempting to win its third straight MAPHL AA Divsion title. Gonzaga will travel to Laurel to face DeMatha in the Washington Catholic Athletic Conference's Capital Conference semifinal playoff round on Thursday, Feb. 13, at 4 p.m. The winner of that game will play the winner of the St. John's vs. Bishop O'Connell matchup in the Capital Conference championship game in Laurel on Friday, Feb. 15, at 5:50 p.m.
Farrell Dinn (12 goals, 9 assists) leads the Eagles in scoring as they approach the WCAC playoffs and a semifinal game against DeMatha on Feb. 13 in Laurel. Gonzaga Seniors (left to right): Will Giblin (manager), Bobby Kelly, Tommy Krisztinicz, Michael Reidy, Matty Thompson (manager), Jack Massey, Kurt Bruun, and Danny Mullennex with Head Coach Sammy Gerdano. Gonzaga’s seniors were big contributors on “Senior Night” as the Eagles (10-6, 4-3 MAPHL) whitewashed visiting Bullis, 10-0, in a MAPHL game on Friday evening at Ft. Dupont Ice Arena. The defending MAPHL champions are now in fourth place in the league’s top-flight AA Division. Jack Massey led the Class of 2019 with four points (2 goals, 2 assists) and Danny Mullennex (2 goals, 1 assist) and Kurt Bruun (2 goals, 1 assist) each had three points in the game. Leading the underclassmen were Sean Kilcullen with five assists, Robbie Dubay with two goals and two assists and Colin O’Leary with a goal and two assists. Luca Docking also scored for the Eagles. Gonzaga put a whopping 44 shots on Bullis’ goalkeeper Alex Burgess, while Eagles netminder Peter Pirone saved all 13 shots he faced to record the shutout. Farrell Dinn (#22) celebrates after scoring just 44 seconds into the third period to ignite a furious comeback from a three-goal deficit against DeMatha. 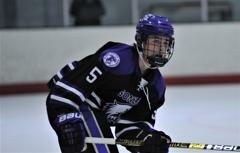 The Eagles eventually fell to the Stags, 5-3, at Ft. Dupont on Wednesday. The much anticipated matchup between DeMatha and Gonzaga lived up to the billing as the Stags built a three-goal lead in the first period, only to watch that lead evaporate in just over five minutes as the Eagles tied the game with three straight goals early in the third period. Jonathan Matta opening the scoring for the Stags at 4:39 of the first period on the power play. Matta’s redirection of a shot from Tyler Mercier trickled by Eagles netminder Harlan Jackson. Mercier put the Stags up, 2-0, on another broken play at 11:33 of first period. To change the team’s momentum, Gonzaga head coach Sammy Gerdano replaced Jackson with Peter Pirone. DeMatha, however, wasn’t slowed as Gabe Franco scored at 12:01 to increase the lead to three. After a scoreless second period, Gonzaga launched their comeback when Farrell Dinn scored just 44 seconds into the third. Less than three minutes later, Luca Docking, who had assisted on Dinn’s goal, struck on the power play to get the Eagles to within one. Dinn got the primary assist, with Colin O’Leary also notching a helper. Only 25 seconds elapsed before Dinn fed Kurt Bruun to complete the comeback at 5:17 of the third period. The Eagles could not muster the go-ahead goal before DeMatha's Connor Eady scored the eventual game winner at 6:35 of the third period. Erick Reiniger scored a power-play goal with 57 seconds left in DeMatha's 5-3 victory. Luca Docking and Max Theissen each scored two goals to lead the Eagles in their 5-2 victory over Mt. 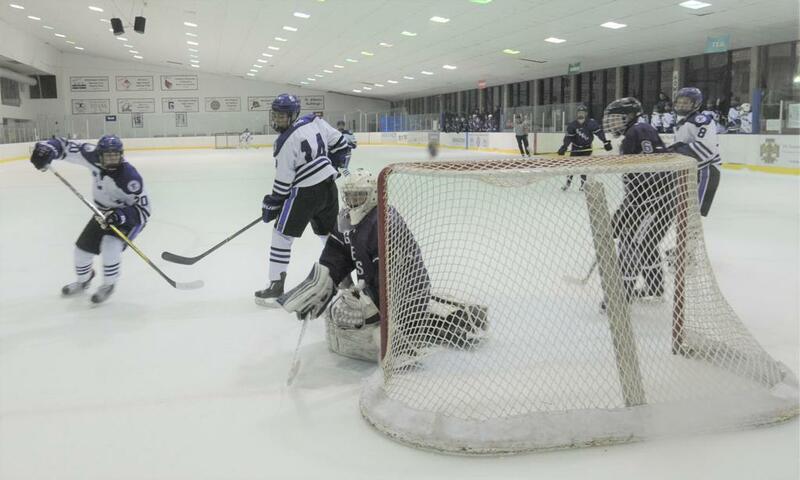 St. Joseph’s at Ft. Dupont Ice Arena on Friday night. Docking got the Eagles on the board first with his first goal just 55 seconds into the game. Jack Norton and Ethan Baxley each picked up an assist on the play. After the Gaels tied the game on a goal by Frankie Gregorini, Robbie Dubay regained the lead for Gonzaga with a goal at 11:07 of the opening period. Theissen increased the lead with his first of the game at 5:39 of the second stanza before Mt. Joseph’s closed the gap again on Gregorini’s second of the game. Gonzaga owned the third period with goals by Docking and Theissen to close out the win. Gonzaga netminder Peter Pirone made 11 saves on 13 shots to earn the win, while the Eagles bombarded the Gaels’ goalkeeper with 45 shots. 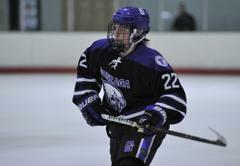 Max Thiessen (#20) paced the Eagles with two goals in their 5-2 victory over Mt. St. Joseph's at Ft. Dupont on Friday night. Harlan Jackson Backstopped Gonzaga's 4-1 victory over top-ranked and previously undefeated Georgetown Prep at Ft. Dupont Ice Arena on Wednesday. 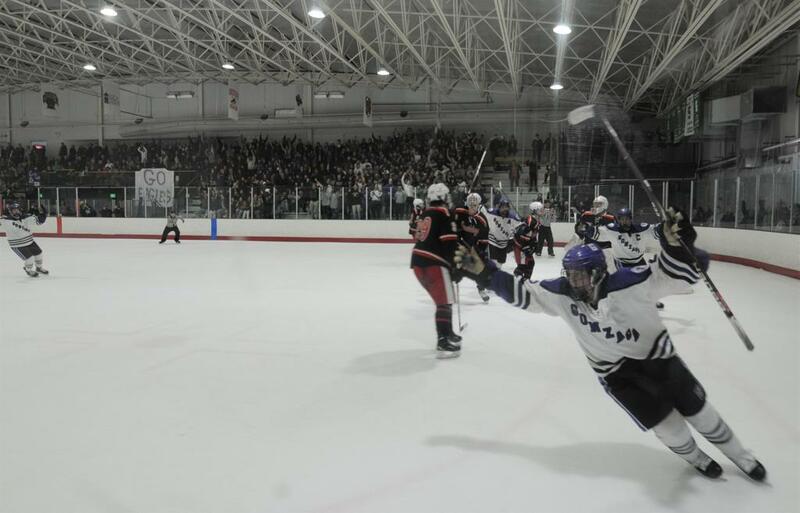 The Gonzaga Eagles began the new year with their best team effort of the season as they defeated top-ranked and previously undefeated Georgetown Prep, 4-1, at Ft. Dupont Ice Arena. The Eagles got steady goaltending from freshman Harlan Jackson, who was perfect until Prep scored its only goal with a minute-and-half left in the game, and goals from four different players to hand the visitors their first loss of the season. Robbie Dubay put Gonzaga up, 1-0, with an unassisted goal less than two minutes into the game. The Eagles added two more in the second period when Farrell Dinn scored the eventual game-winner at 6:20, on an assist from Luca Docking, and Ethan Baxley—assisted by Jackson Massey—tallied at 13:08. Kurt Bruun put the finishing touch on the victory with an unassisted goal at 8:49 of the third period. Jackson finished the game with 24 saves, while the Eagles peppered Little Hoyas’ goalie Elon Granston with 35 shots. 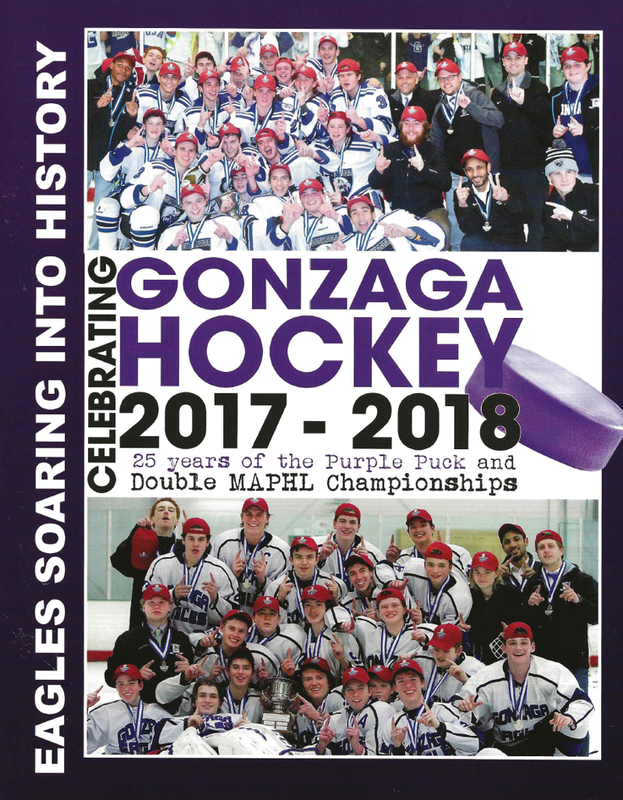 The 2018-19 Gonzaga Hockey Media Guide is a keepsake that features all three teams (Varsity, Varsity II and JV) and includes photos and the accomplishments of Eagles' teams since the program was established in 1992. It is the opportunity to recognize your son and Gonzaga hockey by purchasing an ad and/or help raise money for the hockey program by selling an ad to the many local businesses and alumni that would like to support the program. Click HERE to access the Family Ad Letter and Order Form for the 2018-19 Gonzaga Hockey Media Guide. Thank you for supporting Gonzaga Hockey! Click HERE to view the video highlights from the annual Purple White Game and the ceremony to recognize the Dominik Pettey Memorial Scholarship Fund. 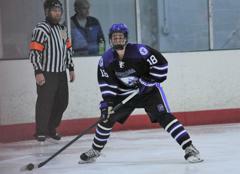 The Eagles tied the Stags on Friday, November 16, at The Gardens Ice House in Laurel, Md. 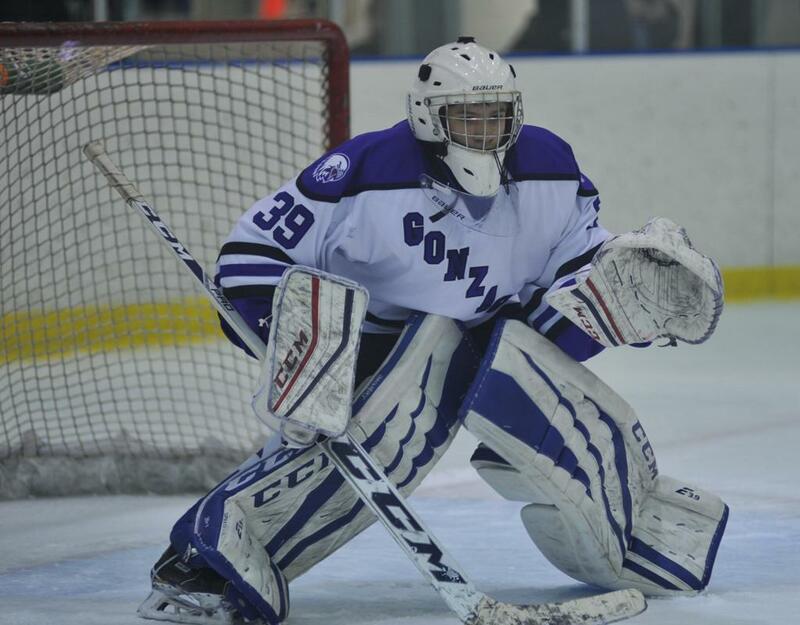 Peter Pirone made 18 saves in Gonzaga's 1-1 tie against DeMatha, including a spectacular pad save with about three minutes left in the game to preserve the tie. 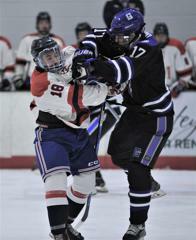 Gonzaga opened their WCAC season with a hard-fought, 1-1 tie with DeMatha at The Gardens Icehouse in Laurel. Farrell Dinn got the Eagles on the board first at two minutes and fifty-seconds of the opening period, but Erick Reiniger equalized for the Stags at 12:34. No goals were scored the rest of the way and play featured several key saves by Gonzaga’s Peter Pirone, including an outstanding glove save in the second and a pad save with about three minutes left in the game. A cross-ice pass gave a DeMatha forward a wide open net to shoot, but Pirone slid across the goalmouth to block what appeared to be an easy tap-in goal. 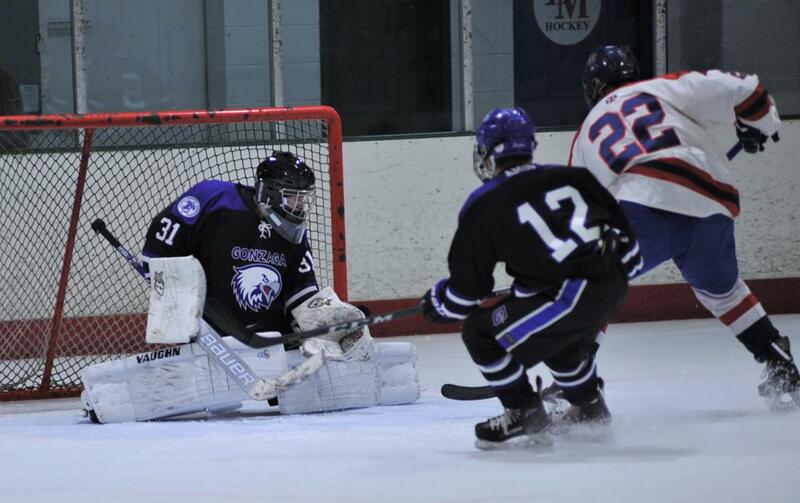 Both goalies made 18 saves in the game, with seven DeMatha shots coming in the 3rd period. 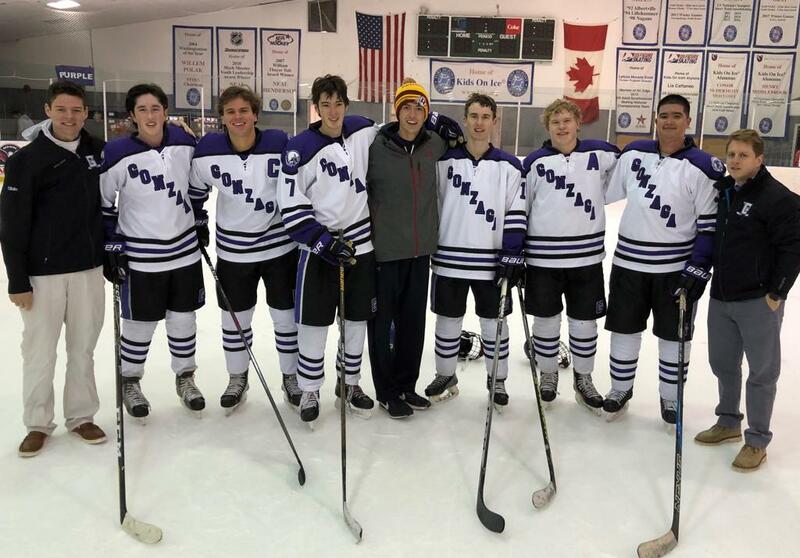 The Purple White Game was a big success, as the annual kick off to the hockey season and fundraising event raised $51,292 for the Dominik Pettey Scholarship Fund through the GiveCampus website. The event was highlighted by Patrick and Magdalena Pettey, Dom's parents, participating in the ceremonial puck drop, and the singing of the National Anthem by Justin Fronda ('20). The White team may have beat the Purple team this year, but in this annual event, the Dominik Pettey Scholarship Fund is always the winner. Ben Plant raised the MAPHL championship trophy for Gonzaga in 2017. The Eagles will go for a three-peat in the top-flight AA Division this season, while the Varsity II team attempts to win its fourth A Division crown in a row. The Eagles will open their 2018-19 season at home against Churchill H.S. at Ft. Dupont Ice Arena. Game time is 4:15 p.m.
Gonzaga will face DeMatha in a non-league tilt at The Gardens Icehouse in Laurel on Friday at 5:50 p.m. While the game will not count in the MAPHL standings, it will be the first time the rivals face off since they played in the MAPHL championship last season. 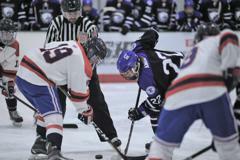 The Eagles defeated the Stags, 4-1, for their second consecutive title in the top-flight AA Division. Opening Ceremonies begin at 4:00 pm; Puck Drops at 4:30 pm. 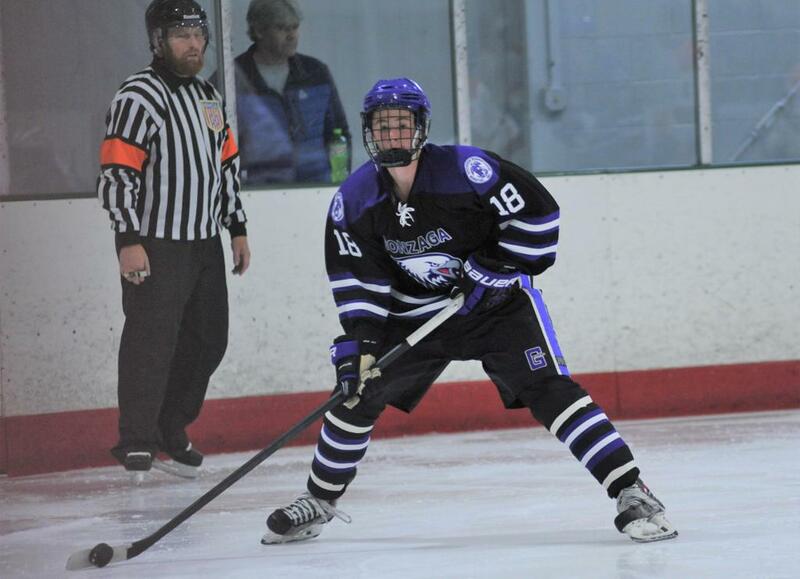 Gonzaga Ice Hockey kicks off the 2018-19 season with the Annual Dominik Pettey Purple White Game, an inter-squad game played in honor of friend and teammate Dominik Pettey ’15, who died in a car accident in 2014. The event raises money for the Dominik L. Pettey ’15 Endowed Memorial Scholarship Fund at Gonzaga. 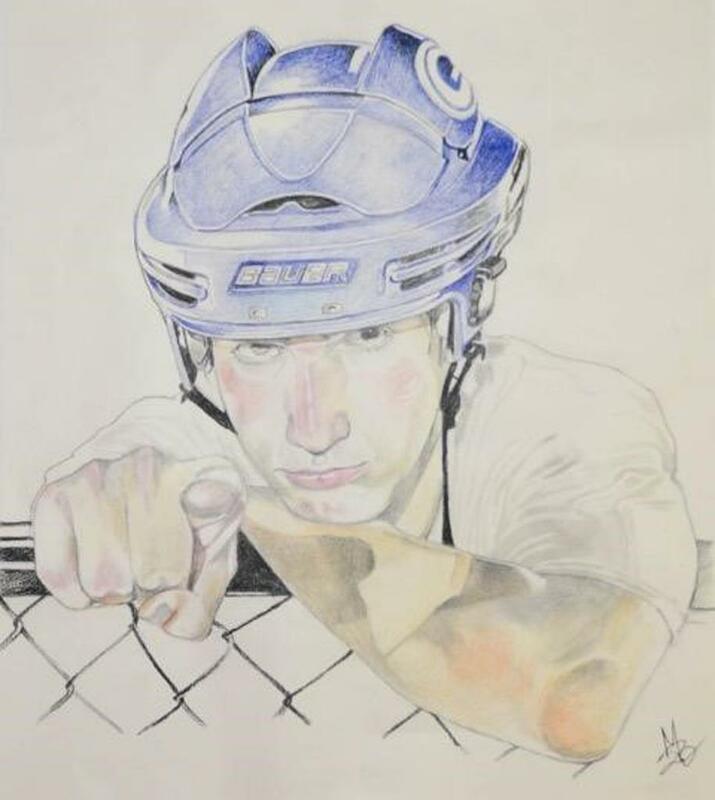 Dominik, whose #11 was retired by Gonzaga hockey after his tragic death, embodied the spirit of Gonzaga, and the fund is one way we keep his legacy strong on Eye Street. All gifts help make a Gonzaga education possible for deserving students. Click HERE to view video about Dominik Pettey. 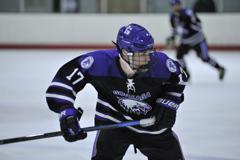 Sammy Gerdano ('10), Gonzaga varsity's new head coach, led the Varsity II to the MAPHL A Division championship last year. 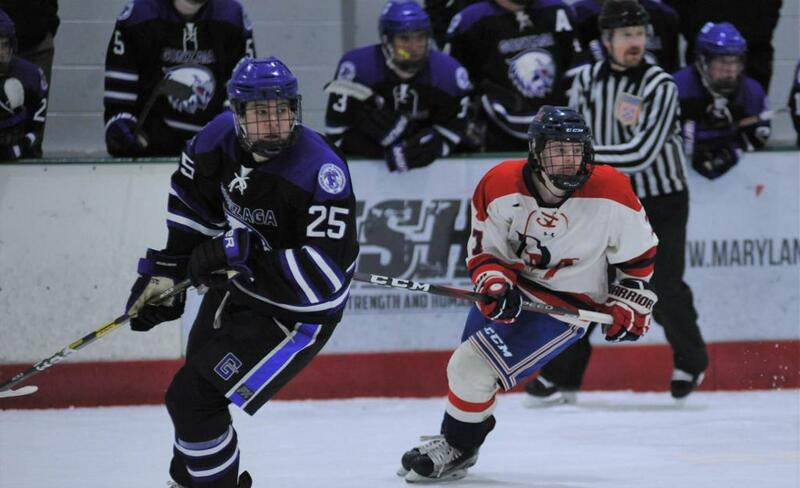 Gonzaga Hockey Director Bill Slater relinquished the head coaching duties to Sammy Gerdano (`10) this past summer. 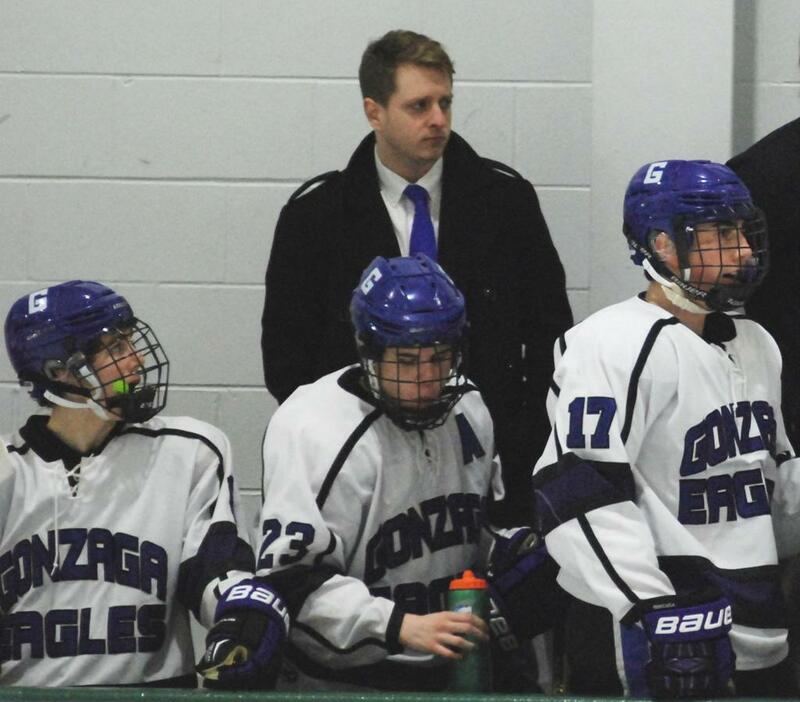 Gerdano served as co-head varsity II coach last season, leading the Eagles to its second straight MAPHL A Division championship. Below is a letter sent out by Gonzaga Athletic Director Joe Reyda announcing the changes. I am happy to share that Mr. Samuel Gerdano has joined the faculty of Gonzaga and will be teaching computer science this coming school year. With that development, I am also happy to announce that he will assume the responsibility of Head Varsity Hockey Coach. 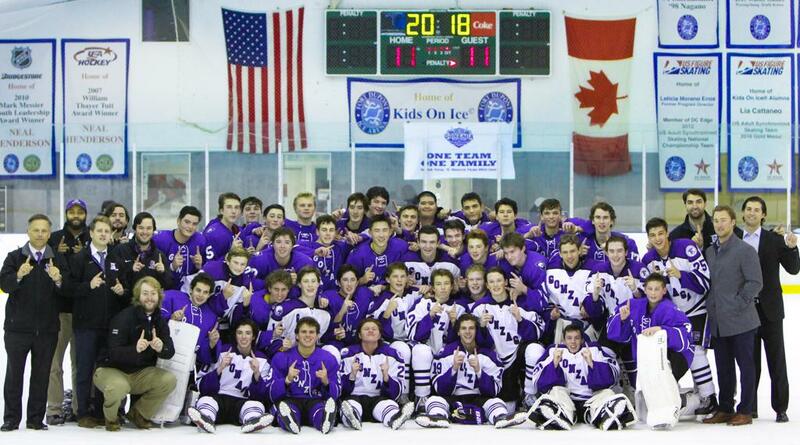 It is a terrific development for the school, the hockey program and, particularly, the boys themselves. Bill Slater and I feel it is critical to the long-term success of the program and most important to the day-to-day success of the boys themselves that the coach is accessible during the school day. Coach Gerdano is a graduate of Gonzaga and has been coaching for the last three years, winning two championships with the Varsity 2 team. He and Ford Lands were named MAPHL Co-coaches of the year this past season. The majority of the coaching staff from this past season will return with the exception of Captain Bill Harris who has been relocated to San Antonio with the Air Force. Bill Slater will remain Program Director working closely with Coach Gerdano and the entire coaching staff to continue to keep the Gonzaga hockey program the premier program in the DMV. Please join me in congratulating Coach Gerdano.